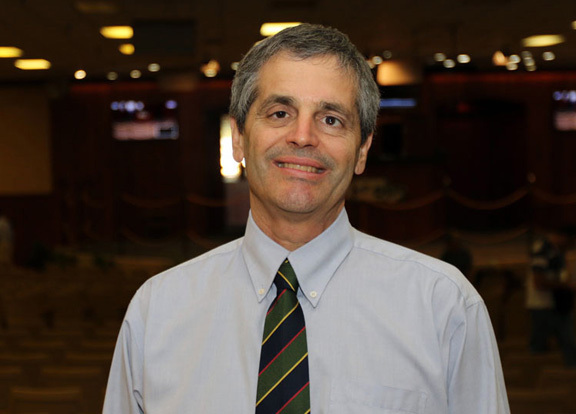 Ocala Breeders’ Sales Company President Tom Ventura chatted with TDN’s Senior Editor Steve Sherack ahead of next week’s OBS March 2-Year-Olds in Training Sale. The first of two sessions begins Tuesday, Mar. 14, at 10:30 a.m.
SS: Since opening the criteria for the OBS March in 2015, the catalog has continued to expand each year–610 (2015), 613 (2016) and now 677 are consigned for this year. What are your thoughts on the group assembled here and the continued expansion of the sale? TV: We’re excited. The consignors have brought a nice group of horses. All of the top sires are represented with multiple horses and the ones maybe with the less-than-elite pedigrees are nice physicals, too. We have 10% more horses this year. I think that was the result of the consignors becoming more confident with the sale in its new format and maybe reaching in and bringing a horse that they may have been a little more reluctant to bring in previous years. I’m not talking about the upper end, I’m talking about the horses that maybe would’ve been pointed to a later sale. They’re taking advantage of the readiness of their horses at this point in time. SS: Are you happy with the results so far? TV: The process in opening it up has been successful. The idea was to keep those core March select horses–and we worked very closely with the consignors before we made that decision. We wanted to entice the buyers that maybe didn’t feel that they would come to a sale that was going to approach a $200,000 average and maybe not have enough horses in their price range. Adding approximately 200 horses on top of what we already had without diluting it too much was important. We didn’t want to go overboard and have 1,200 horses in March. We think it was a good step. The consignors have supported us from the get-go and the buyers are taking note. Whether they’re going to buy a horse for $500,000 or $75,000, there will be something that’ll meet their needs, criteria and budget all at the same time. SS: Seeing the new class of freshman sires represented on the racetrack is always something to look forward to each spring and there are plenty represented here, including several from the first crop of GI Kentucky Derby winner Orb. How do you think this group of freshman sires stack up? TV: I think it’s just a broad group of proven and new sires [represented at OBS March], and the new sires certainly have a lot of potential. I think this is a good crop of first-year sires and we’ll get to see them stretch their legs a bit over the next few days. SS: A high level of outs at the Fasig-Tipton Gulfstream Sale helped contribute to a very low RNA rate of 14.9%. There were already 107 outs listed the day before the first breeze show began for the OBS March Sale. Is this something to be concerned about going forward? TV: I think the consignors just aren’t going to push their horses if they aren’t ready. We do have a time frame by which we have to commit to for printing the catalog, and if the horse has a little bit of a hiccup along the way, they’ll wait until the next sale. That’s a testament, I think, to our April and June Sales. They need to present their horses at their best, and if they’re not ready to show their best, they’ll just wait until the next dance. SS: A relative newcomer in Larry Best came in and made a huge splash at F-T Gulfstream, purchasing two out of three top lots, including the $1.5-million topper, a filly by Uncle Mo. What does that say about the market right now? TV: Anytime you get a new buyer at any level is exciting news, and when you get one that plays at the very top, it’s certainly noteworthy. We wish him success so he continues this endeavor of jumping into the game in a big way. He certainly has stepped up and bought some nicely bred horses and hopefully he’ll come here and find something that he likes. SS: A lot of the bigger operations continue to partner up at the yearling and 2-year-old sales for some of the high-end offerings, including two of three highest-priced lots at last year’s OBS March Sale. What are your thoughts on this trend? TV: We appreciate when any buyer comes here, whether they are partnering up or not. Obviously, you do like the competitiveness amongst the very top buyers. But they’re making decisions on what’s right for them. The consignors would certainly love to see them battling it out head to head, but in the end, they are here to buy horses, whether they buy them in partnerships or by themselves. We’re glad that they are participating. It’s one of those things, just like the consignors sometimes spread their risk by having partners on their horses, the buyers that are taking them to the racetrack and ultimately maybe looking for that stallion prospect, they’re going to partner up earlier rather than later, and while we like to see the battle and the emotions get involved when they go head to head, it’s certainly understandable. SS: Tell us a little bit about the renovations currently taking place at the OBS complex. How far along are they and what’s the vision moving forward? TV: We have what I would say is a pretty large representative shell of a building. We are not anywhere close to being finished. The layout is in place–you can now look out into the chute. There’s a lot of temporary set-ups here, but you’ll get a very good feel of what the end product will be. It’s a challenging project. When we have a 2-year-old sale, it’s much different than any other sale in that these horses are here 10 days to two weeks before the sale. We have to shut down and start back up–that’s the difficult part. Now that we’re in the beginning of our 2-year-old sale season, we’re going to have limited opportunity in between sales where we could do a lot of outside work, so we’ll concentrate on some of the inside work that we can do. It’s certainly a work in progress. I think people will appreciate the effort that we’re making. We’ll get a good feel of what it will look like down the road, albeit it’s certainly in the middle of construction right now. SS: The industry really lost a pioneer with the passing of Clyde Rice in late January. Could you reflect on his life and the impact that he had on the 2-year-old market? TV: He was a tremendous horseman and very influential in the selling of 2-year-olds. If you look around, whether it’s at the racetrack, the sales, or at training centers, there are a lot of connections to the Rice family. I always kid around when I see Bryan or Linda or any of the family–the Rices are like ‘Six Degrees of Separation.’ You can always connect somebody to the Rices. He really had that much of an impact. He was among the first to bring pinhooking to a new level and help establish the 2-year-olds as a source of quality horses.